(March 22): Southeast Asian stock markets ended lower on Wednesday, tracking Asian peers and Wall Street overnight that fell on worries U.S. President Donald Trump will struggle to deliver promised tax cuts and on nervousness, ahead of a key healthcare vote. Trump tried to rally Republican lawmakers behind a plan to dismantle Obamacare on Tuesday, with moderate Republicans worrying that millions of Americans will be hurt by the dismantling of former President Barack Obama's signature healthcare legislation, while conservative lawmakers believe the healthcare bill does not go far enough. Investors worry a failed healthcare push could also portend trouble for Trump's promise to cut taxes and ease regulation that have propelled the market to record highs in recent months. Regional stock markets are down with "the surprise 200-point drop" in U.S. equities, said Joseph Roxas, president of Manila-based Eagle Equities Inc. In Singapore, shares closed 1.3% lower, their third consecutive session of losses, led by energy stocks as global oil prices dipped on rising crude inventory in the United States. Keppel Corporation Ltd fell 1.6%, while Sembcorp Industries Ltd ended 2.8% lower. The Philippine index fell 0.9%, weighed down by financials and consumer stocks, with Metro Pacific Investments Corp, the biggest loser on the index, down 3.2%. 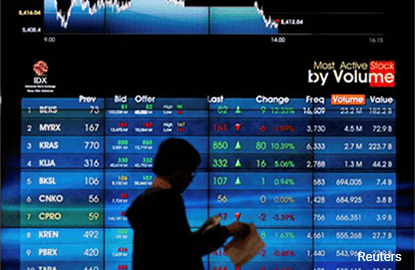 Indonesian shares ended slightly lower, with an index of the 45 most liquid stocks down 0.1%. Malaysia closed down 0.4%, while Thailand ended marginally lower. Vietnam erased earlier gains to close 0.5% lower, pulled down by energy and consumer stocks. Petrovietnam Gas Joint Stock Corp lost 2.6%, while Mobile World Investment Corp fell 1.9%. In Asia, MSCI's broadest index of Asia-Pacific shares outside Japan fell as much as 1.5%, while overnight in the U.S. the Dow Jones Industrial Average and the S&P 500 lost more than 1%.